Researchers from the Evolutionary Studies Institute (University of Witwatersrand), in association with National Geographic, the Department of Science and Technology and the National Research Foundation of South Africa have announced the discovery of a new species of hominin whose fossils were found in an almost inaccessible chamber in a cave system located in the Cradle of Human Kind, on the outskirts of Johannesburg (South Africa). 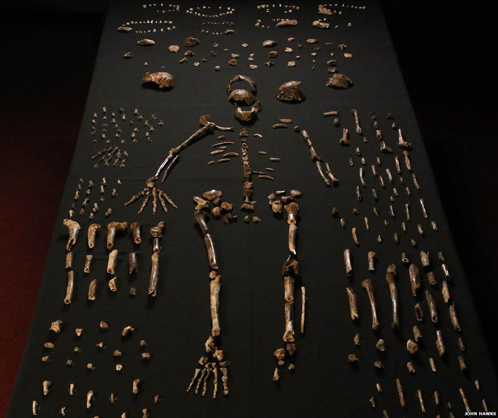 This new species named Homo naledi shows a mixture of Autstralopithecine traits such as primitive hips and shoulders, but size of the teeth, the slender jaw and wrist bones are remarkably like our own. 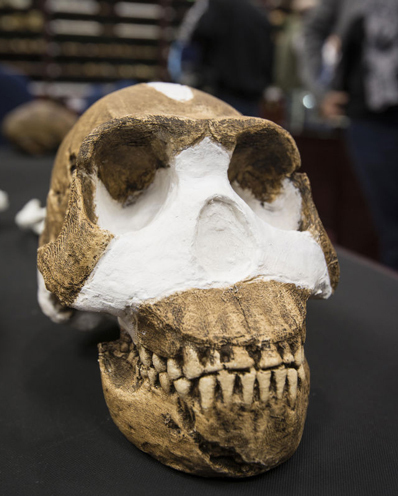 Cautious not to refer to this new species as a “missing link” in our own evolution, anthropologists have suggested that the fossils will provide an unprecedented amount of data on how the human family evolved. As for brain size, the brain of this new species was roughly the size of an extant gorilla. In total, an astonishing 1,550 bones were recovered from the chamber, these represent fifteen individuals ranging from young children, to adults to the elderly. The discovery is the largest single collection of hominin fossils found together in the whole of Africa. Researchers are confident that these fossils will change our ideas about human ancestry. The first set of fossils were discovered in 2013 in a cavern known as the Rising Star (Dinaledi Cave) by Witwatersrand students and volunteer cavers. The fossils were found in a chamber, some ninety metres from the actual main cave entrance. The passage to the cavern where the bones lay was so narrow that only small members of the exhibition team could squeeze through to retrieve them. For Professor Lee Berger (Evolutionary Studies Institute), he had to watch via a video relay, as the students and volunteers carefully removed the bones. This new species of hominin was named after the cave in which the fossils were found. In the local Sesotho language, the caves are known as Dinaledi, the naledi component means “star”. A clearly delighted Professor Berger, was astonished to have so many fossils of the same species to study thanks to the meticulous efforts of the team in the cavern to recover the bones. Very similar wrist bones but curved finger bones more like an ape. The wrist bones are very similar to a modern human’s but the finger bones are more curved, a primitive trait associated with an ancestry of tree climbing (gripping branches). How Did the Bones Get into the Cavern? One of the mysteries about the fossil find is how did the bones get into the cavern? The entrance to the cavern does not seem to have been exposed at the surface and the entrance to the chamber has always been small according to the research team. There is no evidence of a predator having dragged the bones into its den (no signs of feeding on the bones). In addition, there is no evidence that the bones were washed into the cave by flood waters, there is an absence of other material in the cave to suggest that this had happened. 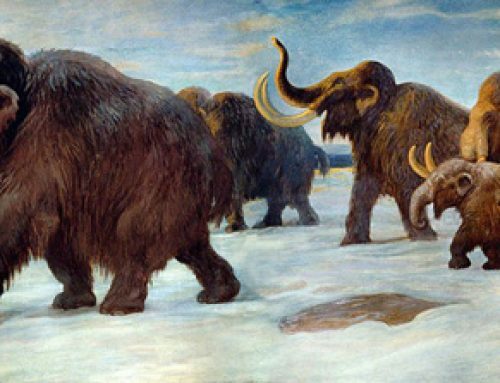 The only other bones found are those of small birds and mice, animals that probably wandered into the cave and became trapped. It has been proposed that this group of human-like creatures fled into the cave for some reason and died there, but an alternative theory, one that has significant implications for our own species and what defines us as “human”, is that the cavern could have been a burial chamber for these hominins. If a member of the group died, the body was carried into the depths of the cave and purposefully deposited at that location. This could be evidence of one of the first ever burial sites known from the hominin fossil record. If indeed Homo naledi was capable of some form of ritualistic behaviour towards its own dead, what prompted such actions? Could this hominin have been capable of abstract, symbolic thought – something that has only been associated with much more recent humans, within the last 200,000 years or so. Is altruistic thinking such as having a sense of bereavement or reverence for the dead an inherited behaviour that runs deep within the human evolutionary line? The age of the fossils is proving a little difficult to assess. The lack of mammalian bones that are contemporaneous prevents an assessment of age based on a faunal study. There is a lack of strata to date from within the cave so analysis of any surrounding matrix is not appropriate for this location. This species could have lived quite recently but it is also possible that Homo naledi could have lived more than three million years ago. More dating evidence is required to permit scientists to place this new species in the appropriate point in the hominin evolutionary tree. A note of praise to the brave cavers and student volunteers, most of them women who had to brave a claustrophobic crawl through narrow tunnels before squeezing through one last tight spot to get to the chamber where the bones lay. You had to be small to enter the cavern entrance. The excavation team were nicknamed “underground astronauts”, thanks to all the field team for helping to bring together such a huge amount of data (the paper has just been published in Elife).